From Domini Games, comes the latest chapter in their popular Dark Romance series! Unravel the secrets of the Minotaur's Labyrinth in the bonus chapter! Explore wallpapers, soundtrack, and more! Never get stuck again with the included strategy guide! Dark Romance: Kingdom of Death Collector's Edition is rated 3.9 out of 5 by 23. Rated 5 out of 5 by skullfun from ~~~~~WOW! DOMINO DELIVERS AN EPIC MASTERPIECE~~~~~ This was an insta-buy for me. A remarkable edition that embraces ground breaking technological advances with an extraordinary mythological story. When gods are fighting each other, mortals suffer the consequences. 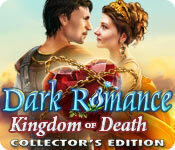 In Dark Romance 3: Kingdom of Death Collector’s Edition Game you will play the role of both mortals — Elias and Persephone. Hades had chosen Persephone, Zeus’ daughter, as a lure for her father. So he kidnaps Persephone during her betrothal with Elias! While they were changing flowers promising to marry each other, Hades changes Persephone’s flower into thorns and drags her to the Underworld, the world of Death! Poseidon, God of the Sea also has a hand in this devious plan to bring Zeus (King of the Gods) to the Underworld. Now it's up to Elias the male character to retrieve and assist Persephone in her quest. By playing both roles in this exciting adventure it adds an element of difficulty and intrigue you won't be able to get enough of. The graphics are stunning and the sound/SFX and VO's are extremely detailed. I didn't even look at the tiny text of dialogue because the lip-sync is perfection. You will also meet other famous characters from Greek Mythology as you work together to solve problems and put their romance to the ultimate test in this intriguing twist on the tale of Persephone! I think this release is a contender for 2016 Game of the Year. Good Luck and Enjoy!!! ? 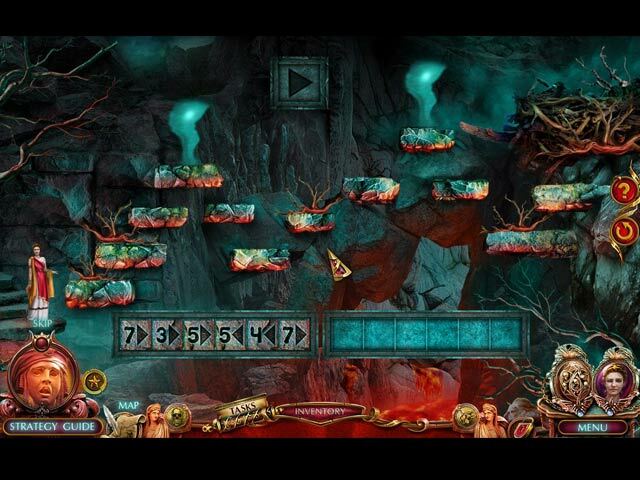 Unravel the secrets of the Minotaur's Labyrinth in the bonus chapter! ? Revisit your collections in the Boudoir ? Explore wallpapers, soundtrack, and more! ? Never get stuck again with the included strategy guide! Rated 5 out of 5 by graceland9 from Great Take on Greek Myth I loved this HOA for many reasons, chiefly because I'm a huge fan of the Persephone/ Hades myth. In this version, Persephone has another love, Elias, who goes to save her from the Underworld. But Persephone is no mere damsel in distress. As Elias battles for her, she works from the Underworld to free herself and get back to him. You play as both characters, switching via a magic amulet. When it glows, you know it's time to become the other. I found this unique feature to be charming, since the lovers work together during the adventure. The challenges were great, including the HOS and an awesome game you play with the 'cowardly captain' in order to advance. There's custom mode and an interactive map, always good. The graphics are gorgeous, and I was intrigued by both Elias' setting and the Underworld. Rated 5 out of 5 by smilingsun72 from A brilliant Twist On Ancient Greek Mythology! Completed CE: I really enjoyed this! It is a refreshing change on the Ancient Greek stories. There are lots of puzzles that range from easy to hard on regular mode. The voice acting is great. All the scenes are beautifully drawn. The music score is fantastic. The small changes that veer from the traditional Greek myths give the game refreshing twist. And the bonus chapter was excellent...it was a whole different story in itself. I don't buy the CE's all the time, but I'm glad I did this time. If you are a fan of Greek mythology I recommend this game. Rated 5 out of 5 by Granny_Gruff from Step into Greek Mythology and Battle the Gods Persephone and Elias are to be wed, with her father, Zeus's, blessings. Unfortunately Hades and Poseidon, Zeus's brothers, have decided to seize his power. Their plot involves kidnapping Persephone and keeping her in the underworld. Zeus expects Elias to save his daughter on his own. As in earlier games in the Dark Romance Series, you will play as both Elias and Persephone alternately, first in the underworld and later back in the real world. You will meet characters from Greek mythology as well as common folk. There will be multiple collectibles including power-ups for the Match-3 game, varied HOPs with a Match-3 alternative, mini-games, beautiful artwork, good VOs, and lots of CE bling. Try the Demo for yourself and see if you also might enjoy a visit to ancient Greece. Rated 5 out of 5 by Torpedo1 from Presephone does not Perspire This game could be runner up for game of the year award. I had some things well done. 2 Character play which I usually do not like. This one was a good enough 2 character game to keep me interested. Game has: Nice jump map, 2 or 3 collectables. Was hard to determine what was a collectable and it was hard to see what I had collected. If I were to guess I would say Greek objects like winged shoes with a lightening bolt on them. The colors of the game made it hard on the eye when searching for collectables and made me not really want to find them. I like games where the collectable can be seen in detail even though it is standing in front of a tree branch or other items. So that was a downer. Puzzles were very easy, HO's were a good percentage of working. Add this fix that type thing, critter action, good characters, good ambiance, and lots to do. Rated 5 out of 5 by pennmom36 from HADES AND POSEIDON VERSUS ZEUS Hades and Poseidon have set a trap to lure Zeus into the underworld and their bait is Persephone, Zeus' beautiful daughter. Zeus knows he cannot help his daughter without jeopardizing his safety, Elias is on his own and must find his way to the underworld to save his fiance. Dark Romance has done it again! They have presented us with a beautiful love story where love has no boundaries. As with all Dark Romance game, you get to play the game from both lovers perspectives, switching flawlessly between Persephone's character in the land of Hades and Elias character who's desperately trying to find his beloved. 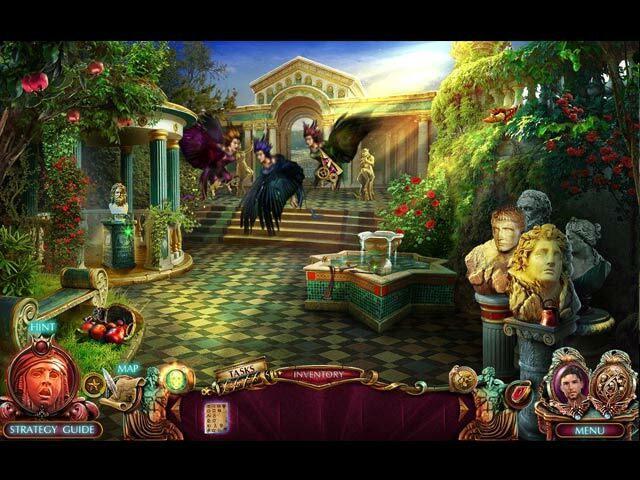 There are lots of Achievements to earn, 14 Artifacts of the Gods to find, 38 Olive branches to collect that allow you to purchase items for the Muse Statues in the Boudoir, and even collectible Power-Ups for the Match 3 games (bombs, lightning, Rainbows) The Hidden Object Scenes are varied with familiar favorites such as Interactive List Finds, as well as Progressive Silhouetted Shape Finds and Spot the Differences, there are even small Zoom Zone HOP's where you find Multiples of items. You can opt for a Match 3 game instead of the HOP's and use the bonus tokens you have collected throughout the game. The Mini Games are fairly easy, although some are a bit time consuming and a tad frustrating. Below are brief descriptions of some of the games you'll encounter during the demo: 1) Choose the matching symbols on the note and the scroll to reveal coded words. 2) Move items to clear a path for a net to catch a fish, which are grid size related. 3) Cover the board with more green than blue stones. If you move one space, the stone will duplicate leaving one behind. If either colored stone touches a different color, the different stone and all adjacent stones will change color. 4) Arrange the plates so that they match the charms hanging below. 5) Place each of the animals on its constellation so the stars line up to key points. 6) Open all the flowers, clicking on some flowers will affect other flowers. This Collector's Edition has 24 Achievements, 9 Boudior muses to adorn, 28 Concept Art pictures, 19 Wallpapers, 5 Music Soundtracks, 14 Collectible Artifacts of the Gods, 10 Movies, 38 Collectible Olive Branches, Journal Notes, a built in Strategy Guide and a Bonus Chapter, enjoy! Rated 5 out of 5 by biscuitsmama from GREEK MYTHOLOGY COMES TO LIFE IN THIS EXCITING NEW DARK ROMANCE If you are a fan of Greek mythology you are sure to be captured by this latest game in the Dark Romance series. Although the developers have taken a great deal of creative license in Kingdom of Death it still will appeal to those who love these ancient myths. As in the previous games we have the unique feature of playing both of the star-crossed lovers. Will true love overcome the power struggle between Zeus and his brothers – Poseidon and Hades? 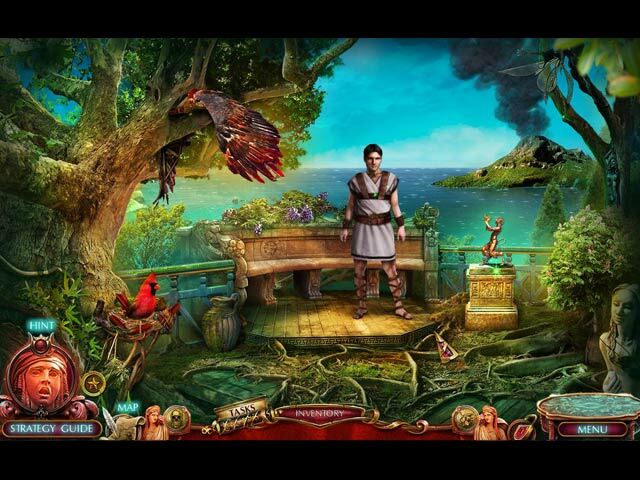 Play this terrific game as you encounter other fantastic creatures from mythology. The game does offer the custom setting, which is the one I normally select if it is available. Even on custom the lowest recharge time for hints and skips is a bit high but that is only my opinion. The graphics are excellent as are the voiceovers. I am very impressed by the realistic characters and love the richness of the overall graphics. Your tools include an interactive, transporter type map as well as a scroll that includes your current tasks. I didn’t come across anything that appears to be a gimmick but even if there is one included, I am sure it will fit well with the storyline. The HOPS are varied, interactive and interesting but if you don’t like completing the HOP scenes you have an alternate match-3 type game. As you play through the game, keep your eyes open and look at everything because you never know when you will find a power-up that will help you with the match-3 option. I am really very impressed by all of the extra little touches the developer has added to Kingdom of Death that make it very entertaining. I have played so many HOPA games over the past ten years that when I find something new and unexpected it is very refreshing and revives my interest in the HOPA genre of games. Kudos to this development team for taking the time to create a game with so many extra touches and little surprises. There is not a lot to say about the mini-games because there doesn’t seem to be anything new but they are still enjoyable. As is the case in most games, I suspect the mini-games will increase in difficulty as the game progresses. There is not a lot to say about the CE version of the game except that it is packed with extras. There are several sets of items to be found and that includes all of those hidden power-ups. There are the usual achievements as well as the standard extras such as the bonus game and the strategy guide. If you enjoy the wallpapers and concept art then this is definitely a game you will want to have. What a surprising and excellent game that caught me off-guard because I really didn’t think I would like this one as much as I do. The last game in the series was not nearly as entertaining so I didn’t expect that I would care for Kingdom of Death but as a lifetime fan of Greek mythology, this game is just perfect for me even though does take a lot of liberties with the myths. If you are a romantic at heart and enjoy a good love story then Dark Romance Kingdom of Death might be the perfect game for you. I would like to thank BFG and the developers who did an amazing job in creating this game. Although I love this game and purchased it almost immediately, please try the demo to see if this is a game you will like.